Poster The Mental Health Services Conference, August 1999, Melbourne. When dreams become a reality: a secure extended care unit goes on holidays. How we tackle the tough questions! Eastern View Community Care Unit makes living in the community a reality. Co-author: Terry Gleeson (Psychiatric Nurse). Paper The Mental Health Services Conference, August 2000, Adelaide. “Shape Up” Healthy Lifestyle Pilot Program. Guest Presenter MindBodyLife Forum, November 2001, Melbourne. “Shape Up” Healthy Lifestyle Program. Poster World Federation of Occupational Therapists – World Congress, June 2002, Stockholm, Sweden. The benefits of a psychosocial rehabilitation program within a community care unit. Presented by Mary Kennedy-Jones, LaTrobe University, on my behalf. Paper The Mental Health Services Conference, August 2002, Sydney. Activity without a goal or purpose is not therapy. Paper The Mental Health Services Conference, September 2003, Canberra. ‘Shape Up’ Addressing physical health issues for people with a mental health illness around Victoria. Paper The Mental Health Services Conference, September 2004, Gold Coast. Are you game to take the plunge? How to attract new clinicians to the mental health waters. Co-author: Jackie Warner (Senior Psychiatric Nurse). Paper International Early Psychosis Association Conference, October 2004, Vancouver, Canada. Beating the Bulge! Addressing weight gain for people on antipsychotic medication. 3 hour Course Canadian Psychiatric Association 54th Annual Meeting, October 2004, Montreal, Canada. ‘Shape Up’ Healthy Lifestyle Program: Addressing physical health issues for people with a mental illness - 3 hour Course. Brief Paper The Mental Health Services Conference, August 2005, Adelaide. Can I drive? A study of health professionals’ knowledge of patients’ fitness to drive. Accepted Abstract The Mental Health Services Conference, September 2006, Townsville. How clinicians and carer consultants work together to meet families needs. 90 minute Paper ACT Summer Institute 4, June 2008, Chicago. Using art as a therapeutic medium for delivering ACT groups to adolescents with depression or anxiety. Co-author: Dr Louise Hayes (psychologist). Poster Presentation WFOT 2010 (World Federation Occupational Therapists) Chile, May. Client Fitness to Drive: Policy Development and Education for Mental Health Professionals. Presented by Dr Linsey Howie, LaTrobe University, on my behalf. Paper National Conference: Consumer-Centred Health Care: Policy, Innovation and Empowerment, 22-23 March 2010. Consumer involvement in mental health research about fitness to drive. Paper TheMHS Conference, 14-17th September 2010, Sydney. Why is talking about fitness to drive so hard? Paper 3rd Australian Rural & Remote Mental Health Symposium, November 2011, Ballarat, VIC. Paper 13th International Mental Health Conference, 6-8 August 2012, Gold Coast, QLD. What would I want from a youth mental health service? Paper 4th Australian Rural & Remote Mental Health Symposium, 19-21 November 2012, Adelaide, SA. Equitable access for young people to mental health services in regional Victoria – is it really possible? Paper TheMHS Conference, September 2013, Melbourne, VIC. The New Face of Mental Health: Early Intervention in Kindergartens. Brief Paper TheMHS Conference, September 2013, Melbourne, VIC. If we are to forge a new future we may need to be brave enough to let go of the past. 90 minute Workshop TheMHS Conference, September 2013, Melbourne, VIC. Interagency Collaborative Care Planning with the Consumer at the Centre…the way of the future. Co-presenters: Michelle Harper, Leigh Cooksley, Katrina Hishon. Poster Presentation 2nd International Youth Mental Health Conference, October 2013, Brighton, England. Services can redesign to meet the mental health needs of youth. Workshop 5th Australian Rural & Remote Mental Health Symposium, November 203, Geelong, VIC. How can a mental health service help community agencies in regional and rural Victoria who work with young people who self harm? Paper TheMHS Conference, September 2014, Perth, WA. Elective Speaker The Journey Women’s Conference, May 2015. 1)	Where are we walking to? – Recognising you are a child of God. 2)	Shoulder rides for weary legs - it’s ok to rest. 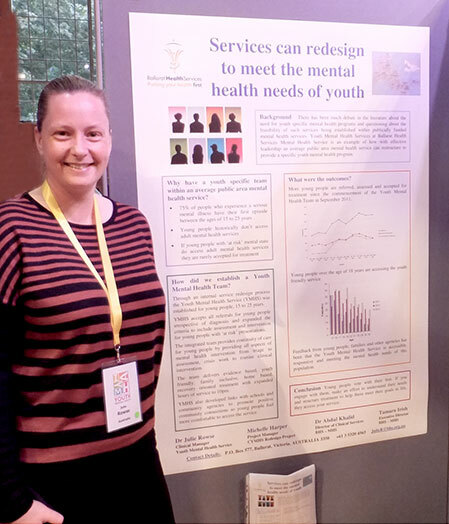 Poster Presentation 3rd International Youth Mental Health Conference, October 2015, Montreal, Canada. Where is ‘me’ in this? Paper 7th Australian Rural & Remote Mental Health Conference, October 2015, Creswick, VIC. Why rural practitioners value shared support planning. Co-authors: Michelle Harper, Caitlin Doogan, Melissa Maas. Key Note Speaker The Journey Women’s Conference 2016. 1)	Living life to the full while riding the rollercoaster. 2)	Go Light Your World.